As the fastest growing prison population worldwide, more and more women are living in cages and most of them are mothers. This alarming trend has huge ramifications for women, children and communities across the globe. Empathy for mothers behind bars and concern for criminalized mothers in the community is in short supply. Mothers are criminalized for their vulnerabilities and for making unpopular but difficult choices under material and ideological conditions not of their own choosing. 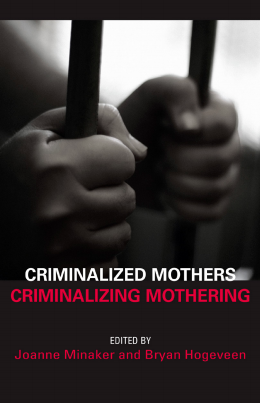 Criminalized Mothers, Criminalizing Mothering shines a spotlight on mothers who are, by law or social regulation, criminalized and examines their troubles and triumphs. This book offers a critical and compassionate lens on social (in)justice, mass incarceration, and collective miseries women experience (i.e., economic inequality, gendered violence, devalued care work, lone-parenting etc.). This book is also about mothers’ encounters with systems of control, confinement, and criminalization, but also their experiences of care. Minaker, Joanne, & Hogeveen, Bryan (Eds.). (2015). Criminalized Mothers, Criminalizing Mothering. (Minaker, Joanne & Hogeveen, Bryan, Eds. ).